I teach Qigong, which is one of the major branches of Chinese medicine. I’ve also done 1500 hours of training in Chinese medicine, including acupuncture and Chinese herbology. Because of this, people often assume that I encourage my students to take Chinese herbs. The truth is that I often DISCOURAGE students from taking Chinese herbs — especially ginseng. Let use a hypothetical example. Martha is a 63-year-old woman who is struggling with severe fatigue. For over a year, her energy has been super low. If this were a Broadway show, now would be the time to cue the orchestra to make the classic dun-dun-DUUUN sound. Jane means well, of course. She wants to help her friend Martha. But in Martha’s case, taking ginseng is a bad idea. A terrible idea. Maybe the worst idea ever. Am I exaggerating? Not really. Ginseng could do considerable harm to Martha. What Jane doesn’t know is that Martha also has high blood pressure. And even if she did know, would it really matter? Would that fact be significant to Jane? Or even Martha, for that matter? Unless you’re a doctor of Chinese medicine, you probably don’t understand the connection between Martha’s high blood pressure and ginseng. And that’s to be expected! You haven’t done 3000+ hours of training in Chinese medicine, you haven’t passed the national board exams, and you don’t have a license to diagnose conditions nor prescribe medicine. In other words, there’s no good reason for you to play doctor. Let’s come back to the hypothetical example of Jane and Martha. In this example, fatigue was the common factor between the two women. But in Chinese medicine, fatigue is just one of many symptoms and signs. There are probably a hundred different things that could be causing fatigue in these women. So fatigue, in and of itself, is relatively meaningless symptom. And yet, for both women, it was the ONLY symptom that was analyzed. Medicine was the prescribed based on that one, meaningless symptom. Folks, that is NOT Chinese medicine. Ideally, both Martha and Jane would go through a thorough diagnostic exam. An acupuncturist would use several diagnostic methods, like pulse diagnosis, tongue diagnosis, asking diagnosis, etc. Some acupuncturists, like my wife, also use other diagnostic methods, like applied kinesiology, functional neurology, and blood tests. In our hypothetical case above, however, we already have enough information to know that Martha should NOT be taking ginseng. We don’t need a diagnosis to know that it’s a bad idea. The key piece of information here is Martha’s high blood pressure. Someone with high blood pressure probably has what is known in Chinese medicine as Qi Stagnation. In other words, their Qi is stuck, like a traffic jam. Martha probably has Qi Stagnation. Because her energy is stuck, she is experiencing fatigue. The solution is to get the Qi unstuck, and her energy will naturally return. Jane, on the other hand, probably has what is known as Qi Deficiency. Her energy isn’t stuck, like Martha’s. It’s just too weak. The solution is to tonify her Qi, making it stronger. Ginseng is one of the best Qi tonics out there. In other words, it tonifies the Qi. And that’s why it worked for Jane. Her Qi was weak, and ginseng helped to build it up. The result was that Jane got her energy back. If Martha, on the other hand, starts taking ginseng, she’s likely to develop anxiety and/or insomnia. Her blood pressure may also get worse — which can be very dangerous for some people. In other words, ginseng will aggravate Martha’s condition, one way or another. Oh, and it won’t help her fatigue either. Because ginseng will build up Martha’s Qi, just like it did with Jane. In Martha’s case, however, the problem is not a deficiency of Qi; the problem is that there’s a traffic jam. What happens if you add more cars to a traffic jam? That’s basically what’s happening when Martha takes ginseng. On the one hand, people want Chinese medicine to be powerful. They often come to me and my wife hoping that Chinese medicine will help with issues that Western medicine couldn’t. And that’s great! Chinese medicine is amazing. My wife and I have helped many people with issues that even the Mayo Clinic couldn’t heal. I’m not saying that Chinese herbs should require a prescription. That’s a bigger topic, really. But I am saying that Chinese medicine is best left to those who are trained in Chinese medicine. If you want to do Chinese medicine safely on yourself, then you have 2 options. Either go to acupuncture school for 4 years, or learn Medical Qigong. Medical Qigong doesn’t involve diagnoses or prescriptions, but it’s still strong “medicine”. It’s an amazing way for people to participate in their own healing. If you are seeing a licensed acupuncturist, and you’ve been prescribed some Chinese herbal medicine — great! Absolutely take it! Chinese herbs work wonderfully alongside Qigong. I guess you’re “fortunate” not to be born as a Chinese person. My mother and other 1,000 Chinese ones swear by the recipes they got from television or friends and family. I also hesitate to take these herbs because authentic ones are harder to come by these days. Anyway another example how dangerous a piece of knowledge can be in the wrong hands. I’ve found many people under the impression that it’s, “just herbs” and, “all natural” so it must be safe! 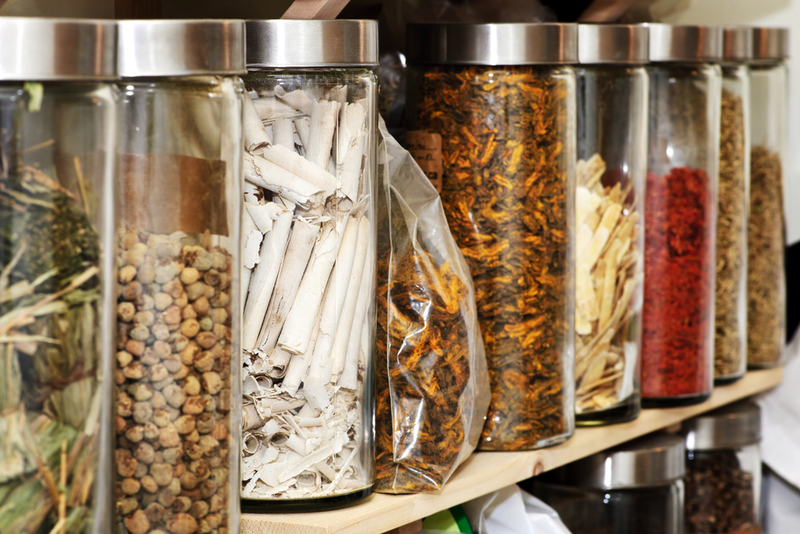 Chinese herbs are basically prescriptions customized to the person and whatever their health issue is. Sure, there’s some classic formulas for certain things, but a lay-person cannot usually diagnose themselves by TCM standards. And before herbs, there’s food. TCM practitioners will often use food first for a mild condition. The herbs are much more powerful. Even though I’ve informally studied TCM over the last 20 years, I never take Chinese herbs on my own and I also dissuade anyone from doing that. Always go to a TCM professional. Well said, Sherry! Thank you! My favorite thing I when people tell me they’ll figure it out themselves. I’ve studied tcm and herbalism is my main branch but I had to laugh at a friend who I recommended see a tcm pro (since I’m not licensed) and his reply was “just tell me the name of the herb and I’ll Google research it and find a supplier” lol whats even more bothersome is he does this with everything without regard for doses, diagnostics or any safety for himself. His mentality is “if you can do it I sure as he’ll can it cant be that hard”. In all honesty I do use herbs myself but I pay close attention to even the most subtle changes and know my body very well do to both having health issues in the past and internal training I do now but I always tell people never copy me. I love how you brought up how people just buy and use what they see on tv (like dr.Oz show). It’s funny that they take all these herbs but pay little attention to diet and the many ways the drain there jing so it’s pretty much pointless in the end. I wish I had seen this advice earlier. I was really stressed and a friend suggested I take ashwagandha (an Ayurvedic herb). But my liver was weak and I experienced great fatigue and numbness in my extremeties abs race from it! Fortunately it happened in the second time so I discontinued it completely with no permanent damage. Wonderful post you have great knowledge about herbs thank you for sharing such a knowledgeable post. I use Chinese natural herbs as they are much more effective and naturally made the main reason for using natural herbs is they have no side effects. Now I’m hoping for much more helpful posts in future! Thank you for writing and sharing on this topic. It seems it is rarely talked about but with herbalism gaining acceptance in the mainstream so is the misinformation. Chinese herbalism is based on the energetics of the herbs and the current state of an individual creating balancing to restore harmony. It worries and saddens me to hear false information and so much cookbook herbalism. I do think herbs could be better regulated.